Lazar is Goodwin’s assistant and Director of the Neo Domino Security Division. 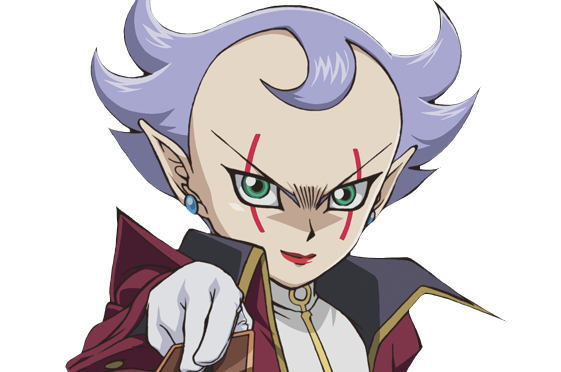 He uses a ‘Jester Deck’, which focuses largely around the use of trap cards to power up monsters and hamper the opponent. He is a short, effeminate man who wears red lipstick and has light purple hair. He dresses in an opulent red costume with a black collar and gold trim. Lazar is New Domino City’s Head of Special Investigations. He is also second in command of Sector Security. He and Rex Goodwin believed Jack Atlas, from Satellite, to be a Signer. On behalf of Godwin he meets Jack and offers him the chance to become King in New Domino City. In order for Jack to do that he must take a Duel Runner and the cards “Stardust Dragon and “Red Dragon Archfiend” through the pipeline to Neo Domino City. He and Mina spot Jack Atlas meeting a person from Satellite, and Lazar has Mina report it to Goodwin. When Goodwin arrives, he, Lazar, and Mina watch the Duel between Jack and Yusei. After analyzing the Duel with Zigzix, Lazar surmises that the clash of two Signers and their dragons is needed for the Crimson Dragon to appear. Goodwin later talks in private with Lazar and they both conspire to confirm their suspicions about Yusei’s status as a Signer. As part of their efforts to root out the Signers, Godwin and Lazar devise the Fortune Cup. Lazar calls off Officer Trudge and invites Yusei to participate in the Cup, threatening Yusei’s Satellite friends if Yusei does not agree. He manipulates various events from behind the scenes during the Fortune Cup, including making sure the right opponents are matched up. Lazar does not seem to get along with Mina, as seen by them bickering while watching Jack duel Yusei. This is made more obvious in the English dub. 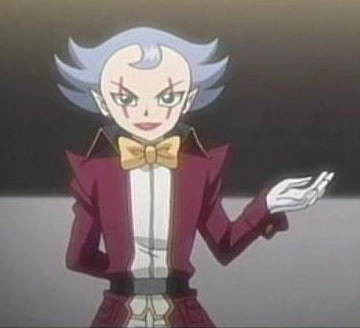 In both versions, Lazar comes across as arrogant, and almost egotistical. He is also mildly sadistic, tending to laugh at anyone’s misfortune, but only when he has the upper hand. When he doesn’t, and he is truly in danger, his attitude changes quickly, and he proves to be little more than a coward. In Episode 43, he is trapped by Crow Hogan, who appears to be very adamant about wanting to take part in the battle against the Dark Signers. Crow will not let him go free unless he finds out more information about the Dark Signers, suspecting that Lazar may actually be a Dark Signer himself. Lazar escapes from Crow’s trap and runs away, leading him to an old, abandoned warehouse in Satellite, the same place where the Enforcers defeated the Magician’s Four years earlier. Crow uses his old duel cuff to force Lazar into a duel using the same house rules that the Duel Gangs used to use. However, a black mist caused by the real Dark Signers causes the duel to end prematurely, causing Lazar to abandon his Duel Disk and flee. He managed to escape the mist safely using his balloon. In the dub he was in a hurry and surrendered. In Episode 56, he confirms to a mysterious man that Goodwin has gone to Satellite to confront Roman Goodwin. In the third arc, he impatiently waits for the arrival of a new Director, and is called off to investigate a strange meteor crash. Upon reaching it he encounters three mysterious people there questioning their reason for being at a forbidden location. Ultimately he realizes that they are from Yliaster, and apparently, according to Luciano, all share the title of director. Lazar plays a Jester Court deck, in which he uses Monsters that resemble court jesters, and Trap Cards that limit the moves his opponent can make. Most of his Trap Cards are Continuous, which serves to limit the number of monsters summoned to the field by his opponent while strengthening his key monster, “Jester Lord”. Several of his cards reference a royal court of justice, which correspond to his career as a top officer of public security. His cards appear in the Ancient Prophecy booster series.